Scarf with matching hat for a modern look while being warm. This beautiful scarf with pompoms is warm and comfortable for winter. 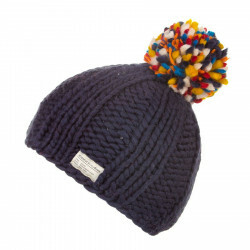 The pompon contrasts well with the plain colour of the scarf for a trendy look. 100% wool and polyester lining. KuSan has a simple philosophy – inspire everyone with its ethical, sustainable products. KuSan offers comfortable woollen garments, designed in London and handmade in Nepal with quality New Zealand wool. KuSan is part of the “Made By” Network: an independent European consumer label for textile companies providing transparency on the social, economic and environmental conditions throughout the whole supply chain of their collections. This label’s commitment is to make sustainable fashion common practice. The “Made By” Label gives consumers the assurance that its products are manufactured in the respect of the people and the planet. Warm and fancy hat for this winter.